Recently, I was in Ashtabula and heading for home. 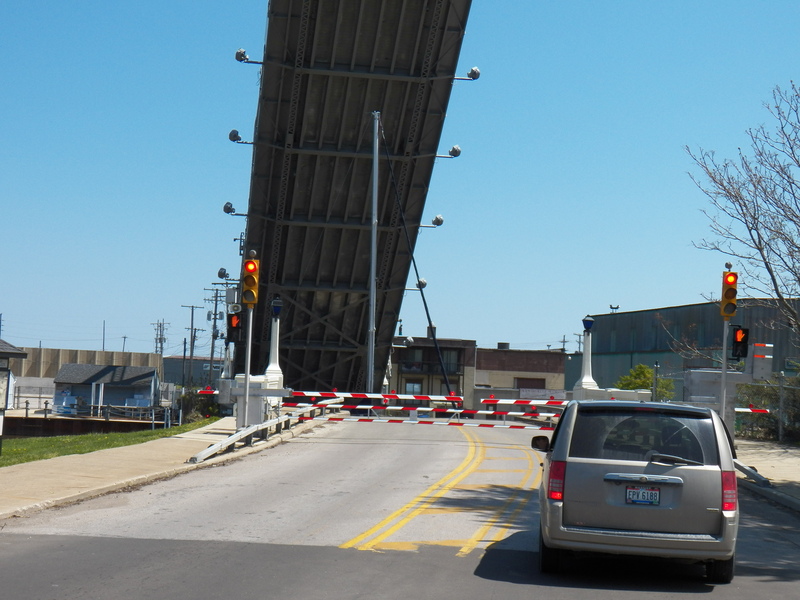 As I drove down Bridge Street, I was forced to stop by the lift bridge. The bridge raises to let tall boats go underneath as they traverse the channel. I was in a bit of a hurry and probably even cursed a little. The bridge does not hurry. It goes up and down in a slow easy fashion. I sat in my truck and watched the giant bridge go up in the air. It was very quiet. I began to look around. I began to relax. The large coal transport conveyor loomed in the background. A freighter made its way up the coal slip. The water was smooth and peaceful. An iron fence stood at the edge of a nice , neat little park. People sat on chairs visiting around little tables placed on the sidewalk outside of nearby businesses. I could hear laughter. The grass in the small park was recently mowed, green and balanced the whole scene. As a sailboat made its way under the lifted bridge, I smiled at myself. The whole delay lasted less than ten minutes. I had no choice but to stop, held captive by the hulking bridge. It was because of the delay that I got to see the Harbor in its new glory. Many buildings , the park and even the bridge itself, have been given a facelift in recent years… I finally got the time to see and enjoy it! I will surely go back. I will pick a quiet, sunny morning…take my wife and go just sit, listen and enjoy. It is the small things that make life grand…I don’t take enough time out for such things beyond the perimeter of my farm. I want to include more quiet, simple, free things into my life. 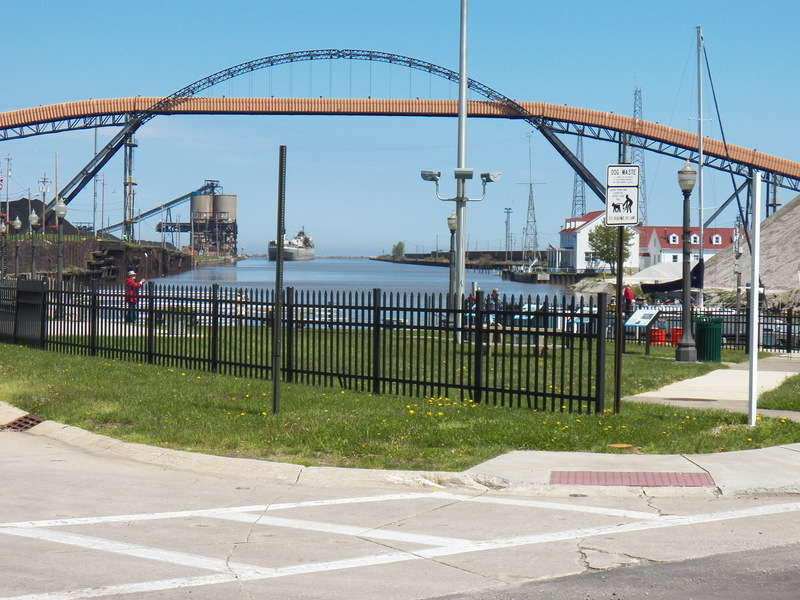 That bridge forced me to stop and look around…much better a bridge than an illness or disorder to cause me to stop… My hat is off to the folks who have turned the Ashtabula Harbor around…and Kudos to me for once again finding the silver lining! Ralph, coming from the tourism bureau thank you for the plug to the historic harbor! The entrepreneurs there are mostly in their 30’s & 40’s and try to use locally grown products whenever possible. Stop into Harbor Perk. They grind & blend their own coffee. Briquettes is incredible and Bascule Bridge Grille buys from local producers. They all pitch in to purchase and maintain the beautiful hanging flower baskets along the street and put on several packed festivals each year. It’s a tourist draw. They have a cool vibe going on down there! I was very impressed. It is a wonderful place. There are shops and eating places for every taste. It has come a very long way since the days of my childhood…..but I do still miss the old hardware store. I even remember the name, but do not want to butcher it with my bad spelling.